A commercial fisherman is being hailed a hero after he jumped into the water off the Central California coast to free a humpback whale entangled in a rope, a rescue that was captured on video in September. When whales become entangled in fishing lines and equipment from other maritime activities, fishermen oftentimes are able to help. 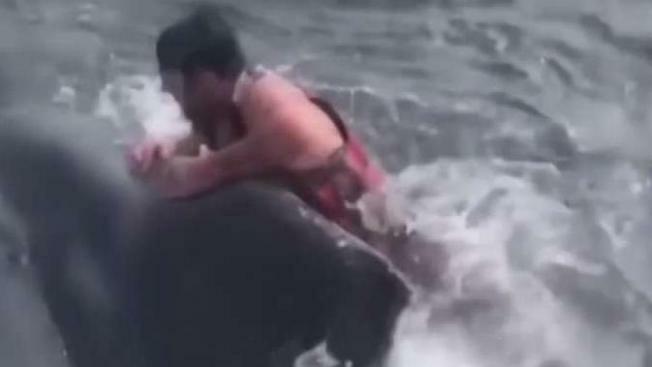 In this case, one fisherman literally risked his life to free the whale. Sam Synstelien leaped onto the massive humpback whale that had a rope wrapped around its back and tail. "(The whale) was just swimming in counter-clockwise circles," said Nicholas Taron, who shot the video of the rescue. "You could tell he was stressed and being held to the bottom." A commercial fisherman is being hailed a hero after he jumped into the water off the the Central California coast to free a humpback whale entangled in a rope, a rescue that was captured on video in September. Melissa Colorado reports. Synstelien and Taron are commercial eel fishermen who spotted the humpback whale struggling off Morro Bay. It was trying to free itself from a buoy attached to a rope. Initially, the crew reported the distressed whale to the Coast Guard. "The Coast Guard kind of finally said there’s nothing else you can do," Taron said. That’s when the crew took matters into their own hands. Taron said they cranked up the volume on the boat’s radio and blasted a message to the whale: "We were screaming at the whale, you’re either going to help us out and quit swimming away or else, like, good luck." Synstelien believes the whale got the message loud and clear. The apparent happy ending could have turned out much worse for the fishing crew, according to the National Oceanic and Atmospheric Administration's Pacific Fisheries. "We’ve had people die trying to get in the water, and just last year, we lost one of our responders," spokesman Justin Veizbicke said. The NOAA says there’s a common misconception that distressed marine animals will die within hours. "Even though it seems like it’s a very stressful situation, we usually have days, weeks, sometimes even months to find these animals and get this gear off," Veizbicke said. The NOAA said those out on the water who see an animal in distress should call the Coast Guard or NOAA’s SOS Whale Hotline at 877-SOS-WHALE or 877-767-9425. The Coast Guard also can be reached on VHF Ch. 16.